After a difficult Women’s World Cup qualifying schedule that included a trip to Pyongyang with no margin for error, the South Korean Women’s national football team will be going to France next summer as a side firmly on the rise. Let’s take a look at the journey the Korean women took to make a second consecutive Women’s World Cup and applaud the work that Yoon Deok-yeo is doing in leading this team to success! Take a look at that goal difference: +20 for South Korea, +17 for North Korea. Those were the margins to get to the Women’s Asian Cup and South Korea were able to make it! With over a year until the tournament in Jordan, Yoon had plenty of time to experiment with his side and find out if there were young prospects who needed inclusion in the WNT setup. Korea set up 2 friendlies with the US Women’s National Team in October where Yoon selected a very young and experimental side needing senior-level experience. Though they lost both matches and only scored once, playing against the best in the world is always a learning experience and a big positive for women’s football in Korea. December’s EAFF E-1 Championship was a bit of a disappointment for the women, as they lost all three games and finished dead last. The main positive from that tournament was Lee Min-a, who was influential in the attack and set up goals with some very accurate crossing. She capped off a career year that included the KFA Women’s Player of the Year and a transfer to Ji So-yun’s old Japanese club INAC Kobe Leonessa. With Korea’s rise to 14th in the December FIFA Rankings, this afforded them the opportunity to make the step up to the Algarve Cup. The Algarve Cup is the longest-running March friendlies tournament and with twelve top-ranked sides it represented a great test for the Korean women in the run-up to the Asian Cup. Yoon brought his best squad and some young players from the US friendlies had earned the step up to the senior side. Son Hwa-yeon, Han Chae-rin, and Jang Chang all returned to the national team after impressing in the US. Korea acquitted themselves well, earning a 3-1 win over Russia and drawing 1-1 with 10th-ranked Sweden before succumbing to Canada 3-0 in the final group match. Horrendous weather on the final day of the tournament in Portugal meant that Korea had to abandon their seventh-place match with Norway tied at 0-0. Because Jordan is not a highly-ranked women’s side but they were the tournament hosts, this meant the draw for the two groups would be very unbalanced. Jordan had to be drawn into the first pot even though they were the second lowest-ranked side in the tournament. In addition, since the seeding criteria emphasized performance in the 2014 Women’s Asian Cup, Japan were placed in Pot 1 even though Australia were ranked higher. As a result, here were the groups for the tournament. One group was very tough (Korea’s group), and the other was weaker. Australia absolutely dominated this match (hence the highlights clip has almost no Korean clips) and were most likely kicking themselves that they didn’t win the match. The possession was clearly dominated by the Matildas and Ji So-yun was really stifled in this match. That being said, it’s clear Yoon Deok-yeo told his players that they would struggle against a more physical Australia and would need to be resolute defensively to stay in the match. 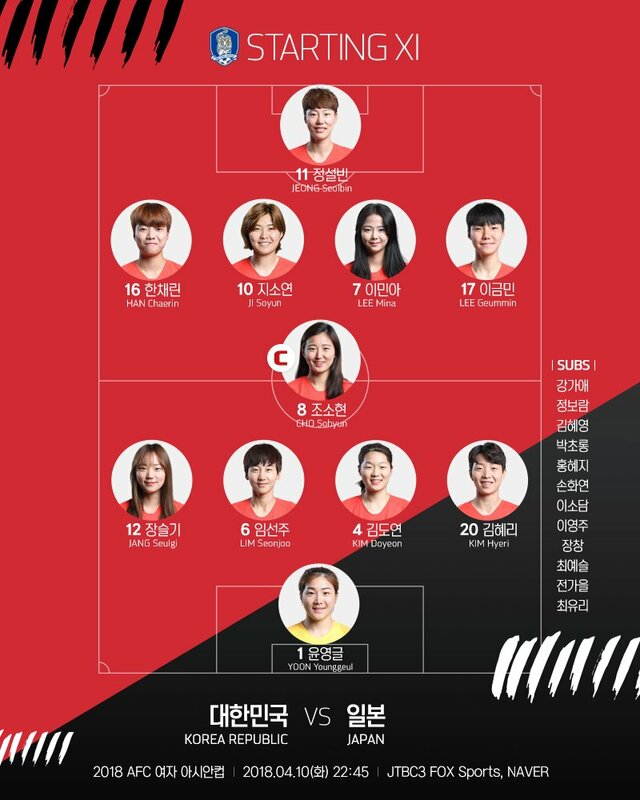 Captain Cho So-hyun was deployed at RB and the experienced pairing of Lim Seon-joo and Kim Do-yeon did a great job dealing with Australia’s star striker Samantha Kerr. There was also an unexpected tactical wrinkle from Yoon. The GK Yoon Young-geul, the new starter, was clearly told to do some time-wasting on the ball during the match. It clearly got into Kerr’s head as she became visibly more frustrated and vocal with the ref as Yoon sat on the ball for too long or surveyed her options before dropping the ball and dribbling a bit before clearing the ball upfield. The ref could have easily given Yoon a yellow card at some point in the match but decided not to. In the end, Australia only had one golden opportunity to win the match and squandered it in the dying minutes when Kyah Simon hit a toe-poke shot over the bar after a very clever dummy by Sam Kerr. 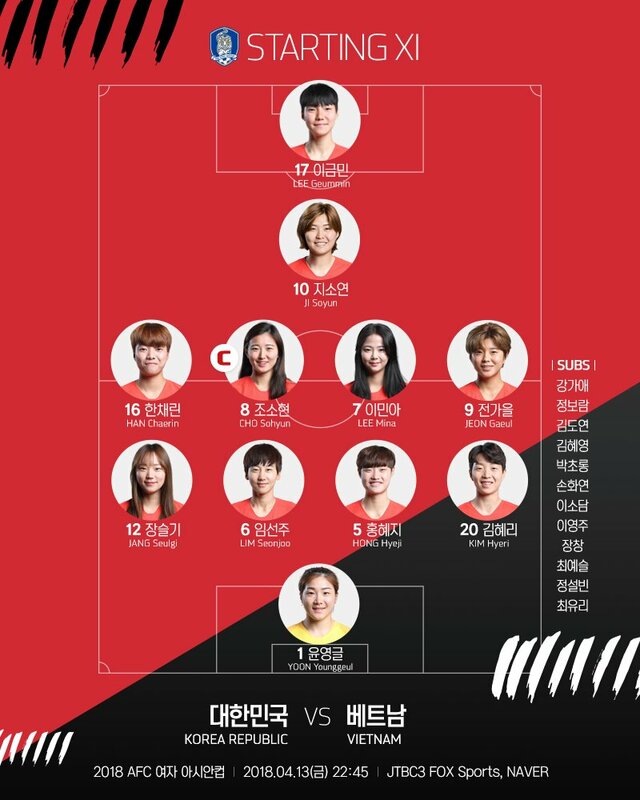 Yoon shuffled his lineup a bit and clearly went for a more attacking side by pushing Cho So-hyun into her usual CM spot. The match was much more even, with both sides having opportunities to go ahead and grab a win but being unable to break the deadlock. Lee Min-a had some good involvement and blazed a shot over the bar in the first half while Japan were on top for a lot of the second half. Yoon remained resolute in goal and made a nice save at the end of the match to preserve the draw. With Australia coasting to a huge victory over Vietnam, the Taeguk Ladies knew they would need goals when they played Vietnam if they wanted to make the semifinals. On the final matchday of the group stage, Yoon Deok-yeo went with his most attacking lineup yet and got the goals needed to keep Korea in the tournament. Veteran Jeon Ga-eul earned her first start of the tournament and Ji was pushed into an attacking midfield role as well. The goals started in the 14th minute with a textbook Cho So-hyun header off of a corner and then a nice finish from Lee Geum-min in the 38th minute. Ji got her first assist of the tournament by capitalizing on a defensive miscue to win the ball and play through Lee. The second half belonged to Lee Min-a as she notched 2 more goals to match Japan’s result. The first was a brilliant long goal as she received the ball off a misplaced GK clearance and knew the GK was scrambling back to her goalline. The next was a goalmouth scramble as Lim Seon-joo threw herself at a redirect off a freekick and Lee was right there to tap home the rebound as the GK spilled the ball. Unfortunately for the Taeguk Ladies, the other match did not go their way. Japan scored first and were all set to win the group and have Korea finish second, but Australia grabbed an 86th minute equalizer to leave all three teams tied on points. The coaches clearly told the players that they needed one more goal, but Korea couldn’t find it and Japan would pip Korea to second place by virtue of having scored more goals than Korea. This match was Jang Sel-gi’s coming out party. The Korean LB has been a stalwart for the Korean women’s sides since winning the 2010 FIFA U-17 Women’s World Cup and at 23 is hitting the prime of her career. She plays for the Incheon Hyundai Steel Red Angels in the WK League, but our friend Hal Kaiser always says it won’t be long before she is playing abroad. She showed why in this match, launching dangerous crosses and then putting on a masterclass for her goal in the 34th minute. After the Philippines thought they had cleared a cross out of the box, Jang was first to the ball and went to work. Her first touch took the ball away from an onrushing defender and then she curled it far post. It was a technical goal that she pulled off like it was nothing. Late in first half added time, Ji picked out Lee Min-a with a nice chip and Lee slotted home. In the second half, Lim Seon-joo poked home another free kick, Cho So-hyun added another header, and Choe Yu-ri did great work to win a penalty that Cho calmly blasted home. The Taeguk Ladies booked their ticket to France in style! In the meantime, look for these ladies to schedule some fall friendlies, hopefully with some European teams to keep sharp ahead of the World Cup, and catch some WK League action if you can (the KFA streams matches free on Youtube). The Taeguk Ladies are pushing on to the world’s stage and we can now proudly celebrate that both our men’s and women’s sides will consistently be appearing at the World Cup!